The Prague metro is one of the most efficient way to get around in Prague. Around 1 million passengers use it every day. Virtually every citizen of Prague has used it at some point of his life. There are 3 lines already in operation in Prague, with 61 stations split between them and over 60 kilometres in length. There are several reasons why this route seems to be final. Let’s go over some of them! The current transportation service in Krč, Libuše, Nové Dvory and Písnice is far from ideal. It would also help alleviate traffic problem and lower the strain on roads. It would also help Red line C, which had its problems with being heavily overloaded at times. And lastly, it would provide a good alternative to Nuselský most. Everyone is undoubtedly interested in the fact, when will the construction start. According to our sources, the works should begin in the first half of 2017. The entire process should be divided into 3 stages. Stage 1 – Pankrác to Nové Dvory, 4.1 kilometres long, 5 stations, start of the construction in 2017, fully operational by the 2022. Stage 2 – Nové Dvory to Depo Písnice, 3.8 kilometres long, 3 stations, start of the construction in 2017, fully operational by the 2022. Stage 3 – Pankrác to Náměstí Míru, 2.7 kilometres long, 2 stations, start of the construction depending on the financial situation of Prague. There are still some possible changes, to ensure the highest efficiency in order to improve the quality of transportation in southern part of the city. These plans predate even the Velvet revolution. 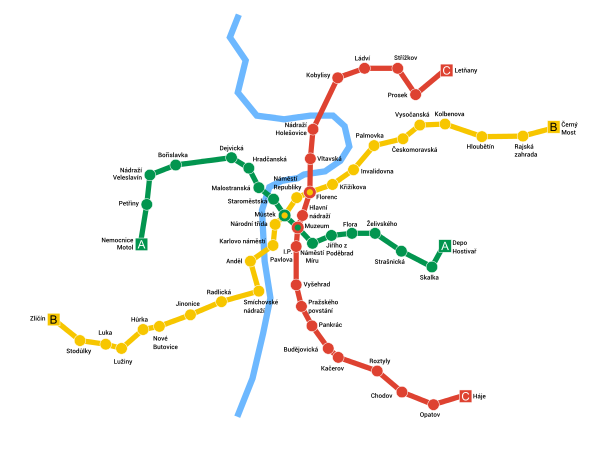 Yes, even our comrades envisioned the Prague metro system having 5 lines! These plans again rose to prominence when Prague was considering applying for the 2020 Olympics. The fact that 2020 Olympics will be held in Tokyo quickly ended any plans for such a line. Currently there no such plans for Line E, but it is possible that with increase in population, in few years, these plans will again become relevant.